Having five kids, a dog, and a cat in the house makes for some very busy days. When you add that many bodies into day-to-day life there tends to be accidents. 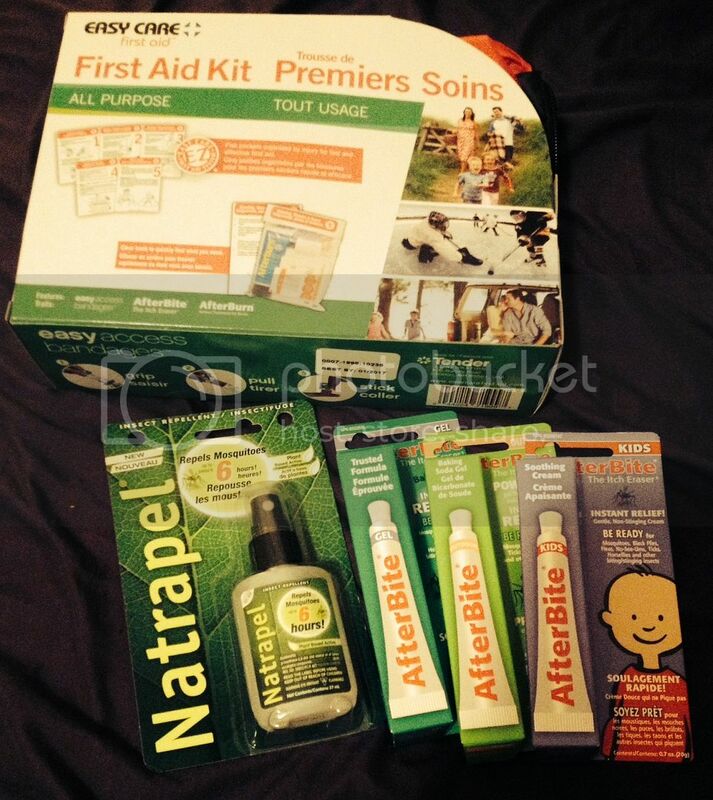 I was recently approach to trial the Easy Care Emergency first aid kit. With it came bug spray and three different versions of After Bite. This year the mosquitoes have been extremely bad. The After Bite couldn’t have come at a better time. Immediately we opened up the kids’ one and started applying it to everyone. It was easy to use and the kids say it worked really well! There was no stinging or anything from it and I didn’t notice a scent. We now make sure to carry after bite on us for those nasty bites we keep getting this year. We have had great success with the bug spray. We have had to spray every time we go outside for a walk or even just to sit outside and enjoy some fresh air. We found that the Natrapel worked better than the other spray we were using. I found the Emergency First Aid kit was well stocked. I put a couple extra items in it such as kid bandages, and steri strips. For most people these items would not be necessary. The first aid kit is in a durable package that is easily transportable. I currently have it in our outside bag so that it comes with us when we go to the park and out for walks. I am going to get another one to keep in the house and probably one for the car. No matter what your family size or dynamic is I feel having an Emergency First Aid kid on hand is a great thing to have. You don’t need anything massive. Make sure it’s easy to grab and has what you think you’ll need to have on hand. I like that mine has different size bandages with antiseptic wipes. We usually need ours for minor cuts and it is perfect to have everything we need in one spot and know where it is. Find more information and purchase the Easy Care All purpose Emergency first aid kit for $19.99. Brittany is a working mom with five children in the home. Her family is her passion and writing is her chance to unwind. You can check out her own blog www.surviving-chaos.com where she writes about the ins and outs of a large blended family! We have an old kit that probably needs replacing because of expired stuff. Good reminder to get a new one. I recently bought 2. One for home, one for the car….ya just never know, right? We also have a Home emergency kit. You always need an emergency first aid kit, especially with children around. I also always had a supply of bits and pieces in my handbag when mine were small. And it wasn’t always the children who needed a bandage. I have a large first aid kit in the house and smaller ones in the car and at my desk at work. It’s so important to have an emergency kit in the car and at home. You never know what will happen. It’s also important to update it every so often so the the expired items can be replaced. Most anywhere you go there is a first aid kit, now a day. I believe that is a great way to be prepared. It’s always good to have an emergency first aid kit handy. We are working on replenishing our current kit. In Germany it is illegal to drive a car without having an up to date emergency first aid kit inside the vehicle. About every 2 yrs a new one has to be bought, as even these have expiry dates on them – the police were very sharp about this too.